Working for an international orientated company is almost impossible without being fond of traveling. We are building stores all over the world, and having feeling with different places and different cultures definitely helps. Last summer we noticed our people were indeed going all over the world, from Asia to everywhere in Europe to the United States. Working on our own carbon footprint every day, we thought it would be nice to inspire our colleagues in their personal journey to a more sustainable life, and compensate the carbon emissions of their traveling. We made an inventory of the distances and modes of traveling, and found out we had to compensate 12.5 tons of CO2. We used GreenSeat (by Climate Neutral Group) to do the compensation. 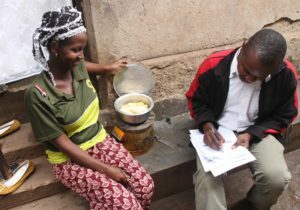 GreenSeat will invest our contribution in the production, distribution and sale of efficient cookstoves in Africa, to make them widely available for local households. In this way, they try to stop cooking on open fire (which causes besides huge CO2 emissions, also lung deseases and it works against social development of women and children because they are busy all day with collecting wood and cooking). Of course we are also compensating our business travels. 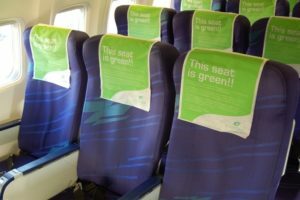 If you want to do the same, ask your travel agent whether they are working with GreenSeat or a similar organization. As a private person, you can compensate your traveling as well through the internet site of GreenSeat.